Professional brewers will tell you that consistency is the the key to great beer. Most competitive home brewers are religious in their measurements and processes to ensure consistently great beer. However, most homebrewers take their measurements at face value without bothering to calibrate them. This week we look at how to calibrate your equipment to make sure you have accurate measurements. Accurate hydrometer readings are important for measuring your original gravity, understanding your brewhouse efficiency, and determining when fermentation is complete. Unfortunately some inexpensive brewing hydrometers are not very accurate. 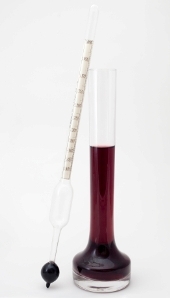 The standard hydrometer is calibrated to read 1.000 when it is placed in distilled water at 60F (15.6 C). Some laboratory hydrometers are also calibrated to 68F, but these are rare. You can usually find the calibration temperature in small letters in the corner of the hydrometer scale. To test your hydrometer, you need some distilled water in your sample tube or a vessel large enough to float the hydrometer. Place the water sample in your refrigerator until you reach the calibration temperature of 60F. Then immerse the hydrometer, shake off any bubbles from the hydrometer surface and take the reading. To read the hydometer properly, you should get your eye at the same level at the water, and find the line where the air and water meet. If your hydrometer reads precisely 1.000, you have a calibrated hydrometer. Otherwise you will need to write down the value and subtract the difference from future readings. For example, if your hydrometer reads 1.002, you will need to subtract the difference (.002) from future readings when using this hydrometer. Accurate thermometers are important, especially during the mashing process when accurate temperatures are critical. Again, many inexpensive brewing thermometers can be off by several degrees. Fortunately thermometers are also easy to calibrate, using the same distilled water you had for your hydrometer calibration. Start by freezing some distilled water in a cup. Then break up the ice into chunks and immerse it in some distilled water. Let it sit for at least 8-10 minutes to reach equilibrium and then drop the thermometer in and read the temperature. If your thermometer is at 32 F (0 C), you have a properly calibrated thermometer. If it is high or low, you will again need to make an adjustment by that amount every time you use the thermometer. Knowing at a glance the volume of your vessels (boil pots, fermenters, mash tuns) makes brewing much easier and more accurate. If your vessel does not have its own marks on it, you can add your own by using a smaller measuring vessel to accurately measure volumes. You can start with a large measuring cup or gradated water bottle to measure quarts or liters. If you don’t have a quart/liter size measure, start with a small measuring cup and disposable 2 liter soda bottle and make your own quart or liter measure by filling the bottle using the measuring cup and marking the outside of it with a permanent marker. Once you have your quart or liter measure, you can fill your larger fermenter or boil pot slowly and accurately to create your measuring marks. For a plastic vessel, you can mark the outside of it using a permanent pen. For a metal vessel you can score or etch it. If you don’t have an easy way to mark the vessel, you can create a dip stick from a small dowel and mark volumes with notches on it. Some brewers even notch their large spoons. Consistency is critical for great beer, so take a few minutes to calibrate your equipment up front. Thank you for joining us on the BeerSmith home brewing blog and don’t hesitate to subscribe if you want to receive more of my articles on homebrewing for free. Find the height of 4Gs liquid in a kettle with an 11 3/4″ diameter. There are 231 cu. in. per gallon. Am I the only one that thinks that the same beer that comes out exactly the same time and time again isn’t always a good thing? Sometimes you want some variation and you never know what you might stumble upon as a result. In addition to that, you’ll never going to be able to get each batch 100% like the batch before. There will always be small variations not just in ingredient measurements, but the water consistency, hops etc. I can’t say I agree with you. It is very easy for me to ADD variance to my process and get the variety you seek, but the real test of a brewer’s skill is being able to recreate a consistent product. Say you stumble upon the best beer you’ve ever made – how are you going to make it again if you don’t take detailed mesaurements and notes on your process? My take on things is I want to produce the best beer I can, and I want people who try my IPA or California Common to have the same experience each time – if I serve them a different tasting beer, I want it to be by design, not chance. But, to each their own, and you should brew however makes you happy! Ordering Wine Making Supplies | Wine Makers Valley!